September is normally the worst month of the year for the market. 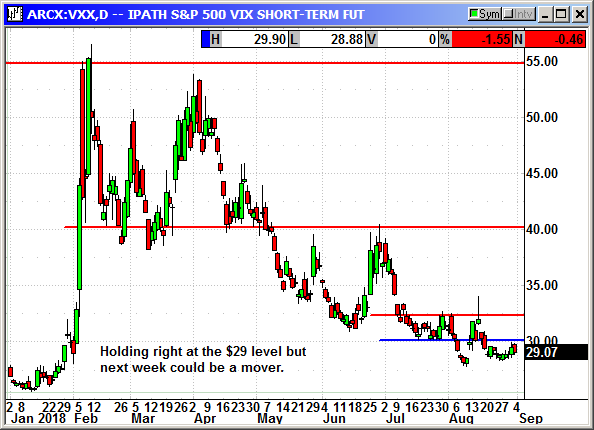 However, that does not mean we are due for a nasty sell off but we are likely to see some volatility. The average decline is only 1.0-1.5% which would only be 30-45 S&P points. While that would be painful it is not even close to a normal bout of profit taking. We saw a 100-point decline that started on June 13th, a 50 point decline that started on July 26th, a 40 point decline that started on August 8th. These happen all the time but that does not mean they are enjoyable. They are buying opportunities in a long-term bull market. When you average results over a long period of time, most "averages" are calculated since 1950, it erases the big gains and losses. For instance, in September 2017 the S&P posted a 48 point gain. That was only about 2% but it is sure better than the long-term average. New highs on the S&P, Nasdaq and Russell are a great way to begin September. The trick is keeping the rally going. 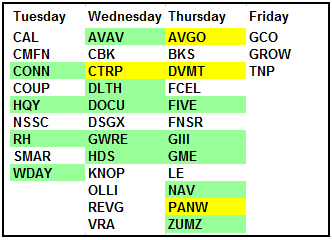 September tends to have a lot of negativity and since the earnings are basically over there is little to distract traders from the headlines. This year those headlines are the current trade war with Canada, China and the EU, the potential government shutdown on October 1st and the Fed rate hike the last week of the month. The Canadian problem should be resolved soon. They cannot afford to be left out of the new deal and have massive tariffs placed on the items they export to America. It is all over but the whining. Everybody knows it but the headline still needs to be printed. That should be a positive for the market unless the president has to resort to tariffs to get Canada to concede. Eventually they will concede. European countries are in talks. They do not want to wait until the last minute and be forced to deal the tariff issues. They would rather be civil and just come to an agreement. This will all be market positive. The China problem is going to be a longer problem. China's Xi does not want to lose face by giving into the U.S. but their economy is cooling, political unrest is brewing and the government has its hands full fighting its debt problems. Xi will eventually concede because Trump has more leverage against China than they do against us. Xi is not stupid. He understands the U.S. election cycle and will probably wait until closer to the election in hopes of getting a better deal. After the election his leverage goes away and Trump and continue to cause him pain. The government funding cycle requires a bill or bills to be signed by October 1st. When lawmakers come back to work in September they only have 11 days to resolve the funding issue and get a bill to the president's desk. He has vowed not to sign an omnibus funding bill like he was forced to do last time. He is demanding a minimum of $5 billion for the border wall and is likely to refuse funding for various departments until that funding is included. The odds are very good that there will be a partial shutdown on Oct 1st unless everyone agrees to a continuing resolution until after the elections. Then the shutdown will happen in November. The Fed is virtually assured of hiking rates in late September. 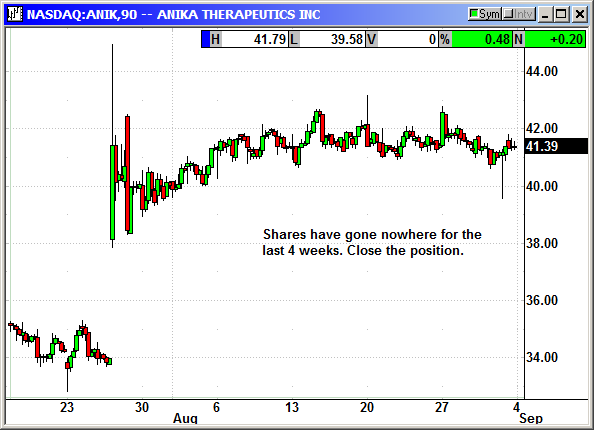 Since it is so well known there is little chance of a market impact unless the commentary changes. This is simply one more step in the markets wall of worry. All of these headlines will begin to come together in mid September as reporters begin to speculate on the eventual outcomes. 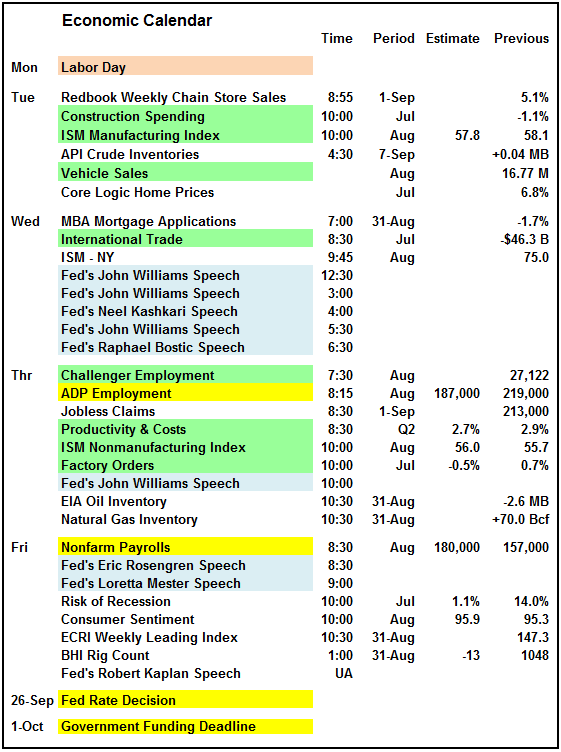 The economic calendar for this week is very busy with multiple reports that could move the market. The ISM Manufacturing on Tuesday is the biggest manufacturing report for the month. The ADP Employment on Thursday and Nonfarm Payrolls on Friday are also closely watched. Any material decline in either one could trigger investors to start worrying that the cycle has peaked. However, with the weekly jobless claims numbers are at 45-year lows. That means the employment reports are not likely to take a sudden dive. There are nine Fed speeches this week. John Williams is working overtime with three on the same day. The composition of the Fed members is evenly split on expectations. Of the 16 members 8 of them expect 2019 rates over 2.9% and 8 of them expect that level or below. Several want to halt rate hikes now until the current stimulus impacts work their way out of the system. Currently the Fed Funds Futures are predicting a 98.4% chance of a rate hike at the end of September. There is a 71.2% chance of another hike in December. For 2019 chairman Powell has said there will be a press conference after every meeting, not just the quarterly meetings. This emphasizes that every meeting is "live" and has the potential for a rate hike. This should increase the uncertainty and could lead to higher market rates without the Fed having to take action. The years of a calm, laid back Fed, may be over and that is not good for the market. 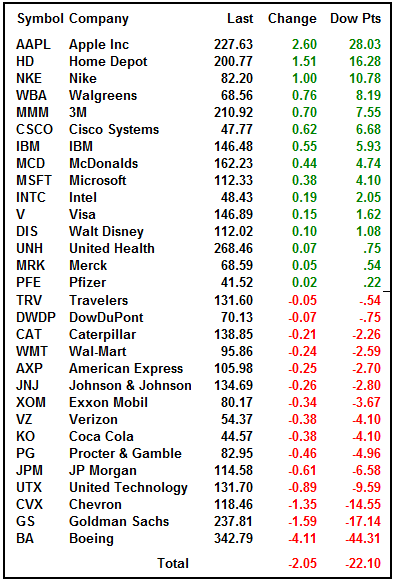 On the S&P, 496 companies have reported earnings. The current earnings growth rate is 24.9% for Q2 with 9.5% revenue growth. Back on January 1st, the growth estimate was only 11% for earnings. The current forecast for Q3 is for earnings growth of 22.4% and revenue growth of 7.7%. There have been 38 guidance upgrades and 73 guidance warnings for Q3. There are some large tech companies reporting next week. Dell Technologies reports on Wednesday and could give us an update on the plan to take the entire company public again. Ctrip.com, Broadcom and Palo Alto Networks rounds out the big tech schedule. Volume was light at 5.8 billion shares but that was still surprisingly higher than a normal summer holiday Friday. The same Friday in 2017 barely broke 5.0 billion shares. Of course, the markets were not at new highs in 2017. The week after Labor Day was lethargic but starting on September 11th the market exploded higher and ran for 411 S&P points to peak at 2,872 in January. 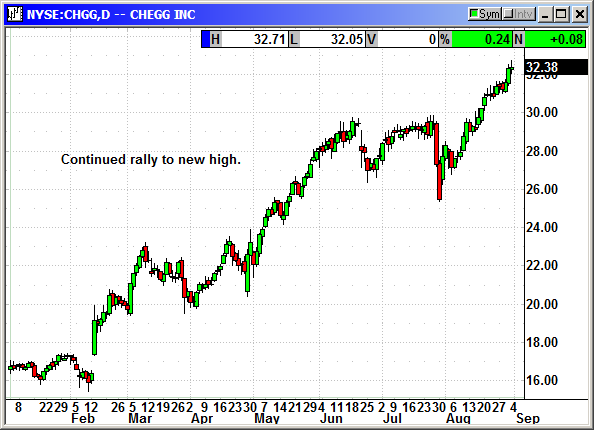 I know we would all love to see a repeat of that rally. 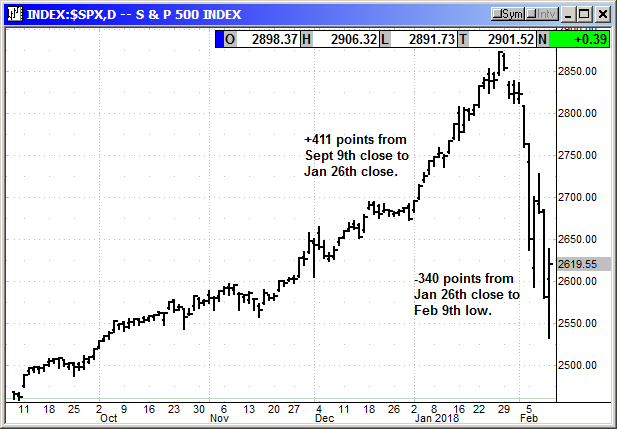 Unfortunately, between the January 26th peak and February 9th low, the S&P gave back 340 of those points. This was the proverbial rally to die for and anybody without tight stops in late January did see their positions die. They say the markets take the stairs up and the elevator down. 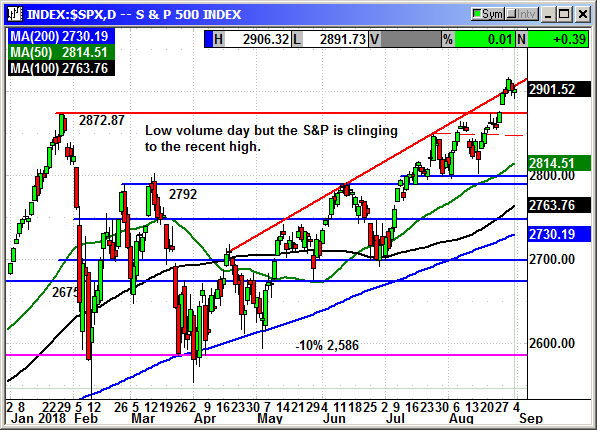 While we cannot expect the market to give us a repeat performance, the fundamentals remain strong. Unfortunately, with the political headlines expected to increase in intensity the current Teflon market may begin to fray around the edges. With Q2 earnings over for all practical purposes, there will be less support and the potential for some post earnings depression. In the past, there has been a flurry of updated full year guidance in September now that companies are nearly 75% through the year. We have also seen portfolio managers trimming some positions to raise cash for any October dips. October is known as the bear killer month because most declines through September tend to bottom in October and those dips are bought. Current support on the S&P is 2,900 but that is new and weak. Prior resistance at 2,872 could be a decent resting place on any profit-taking decline. I would not plan on a dip but I would not plan on the markets surging higher in the week ahead. The post Labor Day week tends to be volatile. The Dow remains at mercy of the tariff sensitive stocks. Boeing gave back $13 after the weekly high on Monday. That is roughly equivalent to 91 Dow points. Until the China trade situation is worked out, the Dow will continue to be volatile and the index laggard. 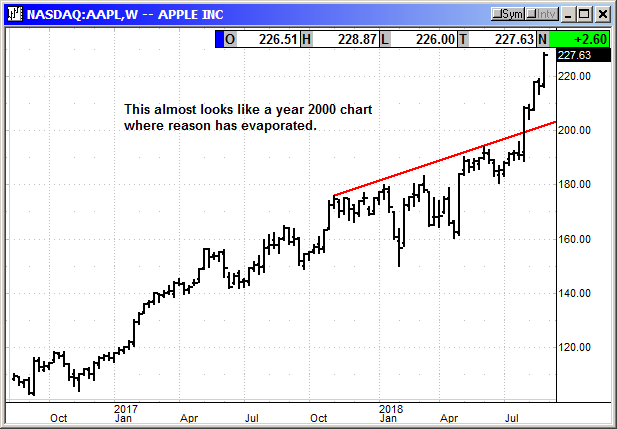 Apple could be a challenge in the weeks ahead. Apple shares rose 20% in August. With the iPhone announcement on September 12th, there is a good possibility for a sell the news decline. It does not happen every time but it does happen quite often. Since shares are up $37 over the last month, (259 Dow points) the potential for post announcement profit taking is very high. Of course if we are expecting a decline it will never happen. 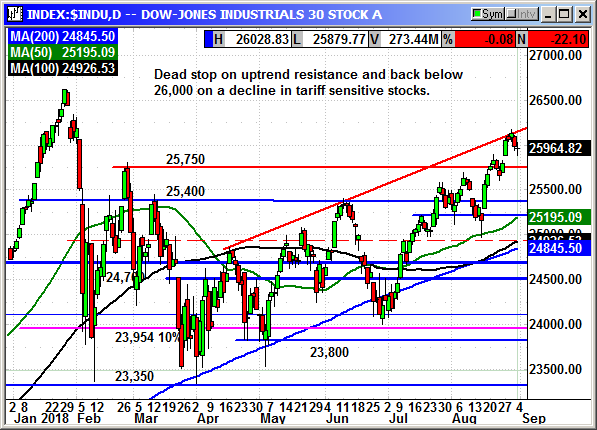 The Dow is still fighting uptrend resistance around 26,100. Next week could be a fight unless a Canadian trade deal appears quickly. Support is back down around 25,850. 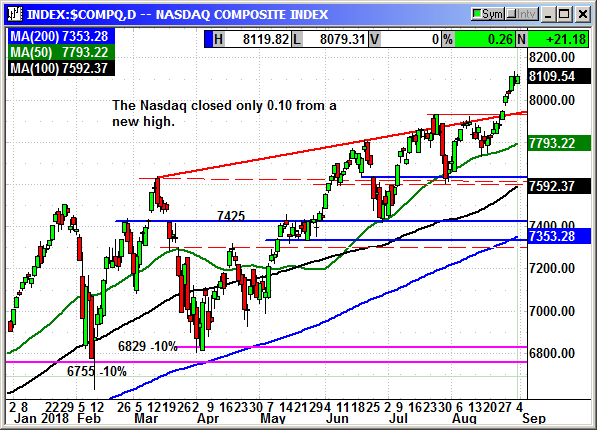 The Nasdaq Composite closed only 0.10 below the record high. The strong gains by Amazon, Apple and others offset the drag from Alphabet. Considering it was a pre holiday Friday with decent event risk, this was a strong performance. The Nasdaq is over extended in the short-term and the same Apple risk for the Dow is a risk for the Nasdaq. Apple is 12.6% of the Nasdaq 100 index, Amazon is 11%, Google 9.3% and Facebook 5%. 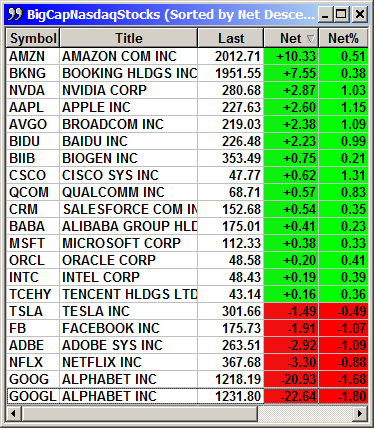 With the Nasdaq up 5.8% for the month, Apple 20% and Amazon 13%, there is definite risk for profit taking in September. This was the best August for the Nasdaq since the year 2000. The Russell outperformed again with a nice gain to a new high thanks to the resumption of the tariff headlines. The small caps should be somewhat immune to tariffs. 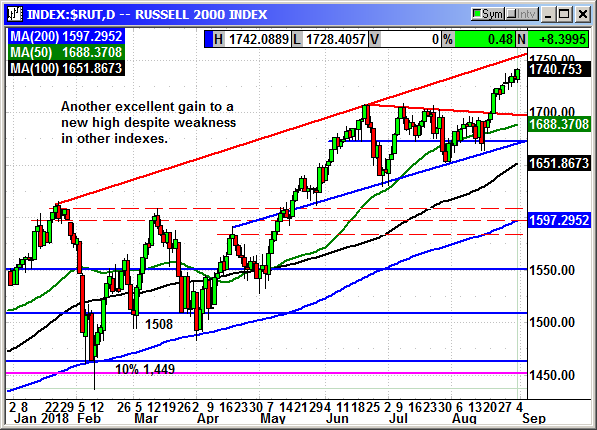 The Russell is also overextended and nearing uptrend resistance around 1,750. Even with the potential for some volatility in September, I would still be a buyer of the dips as long as you remember the potential budget pitfall at the end of September. In trader terms, a month is a lifetime but the market has no calendar. It remembers nothing and never needs a reason for profit taking. All we need is for a handful of large portfolio manager to decide around the same time to trim positions and a decline is born. Investors understand there is no alternative to equities. Getting 3% a year in treasuries cannot compete with 20% in a month from Apple. With the rest of the world markets fading, money is coming back to the U.S. because it is the strongest market in the world. Add to that the $1.5 trillion in announced stock buybacks and there is a lot of support under the market. Of that $1.5 trillion, analysts expect only $800 billion or so will actually be purchased in 2018 but that is still a massive amount of stock taken out of the market. Earnings at 25%, GDP at 4.2%, record buybacks, low inflation, accommodative Fed, low unemployment, 45-year low in jobless claims, record consumer confidence and the Target CEO said this is "the best retail environment in his lifetime." Why would investors not buy stocks? Look for a dip because the market is more than likely going to continue moving higher long-term. Mallinckrodt public limited company develops, manufactures, markets, and distributes branded pharmaceutical products in Canada and the European Union, as well as in Latin American, the Middle Eastern, African, and the Asia-Pacific regions. The company markets branded pharmaceutical products for autoimmune and rare diseases in the specialty areas of neurology, rheumatology, nephrology, ophthalmology, and pulmonology; and immunotherapy and neonatal respiratory critical care therapies, as well as analgesics and gastrointestinal products. It offers H.P. Acthar Gel, an injectable drug for various indications, such as proteinuria, multiple sclerosis, infantile spasms, ophthalmic, neuromuscular disorders, dermatomyositis, polymyositis, rheumatology, and pulmonology; Inomax, a vasodilator to enhance oxygenation and reduce the need for extracorporeal membrane oxygenation; Ofirmev, an intravenous formulation of acetaminophen for pain management; Therakos, an immunotherapy treatment platform; and Amitiza for the treatment of chronic idiopathic constipation. The company is also developing StrataGraft, which is in Phase III and II clinical development for the treatment of burns; terlipressin for the treatment of hepatorenal syndrome; MNK-1411 for the treatment of Duchenne muscular dystrophy; Stannsoporfin, a heme oxygenase inhibitor for the treatment of jaundice; Xenon gas for inhalation; MNK-6105, an ammonia scavenger for the treatment of hepatic encephalopathy, a neuropsychiatric syndrome associated with hyperammonemia; VTS-270 that is in Phase III development for Niemann-Pick Type C, a neurodegenerative fatal disease; and CPP-1X/sulindac, which is in Phase III development for Familial Adenomatous Polyposis. Mallinckrodt public limited company markets its branded products to physicians, pharmacists, pharmacy buyers, hospital procurement departments, ambulatory surgical centers, and specialty pharmacies. The company is based in Staines-Upon-Thames, the United Kingdom. Company description from FinViz.com. MNK reported earnings of $1.78 that beat estimates for $1.48. Revenue rose 5.3% to $631.7 million and beat estimates for $620 million. The raised full year earnings guidance from$6.00-$6.50 to $6.50-$6.90 and revenue growth guidance from 3%-6% to 4%-7%. I will not bore you with all the different drug details but they have multiples that are growing recenue by double digits. Net sales for Acthar is expected to exceed $1 billion. They have sold off some non-core assets and acquired drugs, Amitiza and Rescula, which will produce about $200 million in 2018. This is going to be a transformational year with multiple drugs significantly through the pipeline process and involved in various trials. As you can tell by their raised guidance they believe they are on the right path. Shares spiked from $24 to $36 on the earnings, a 50% gain. 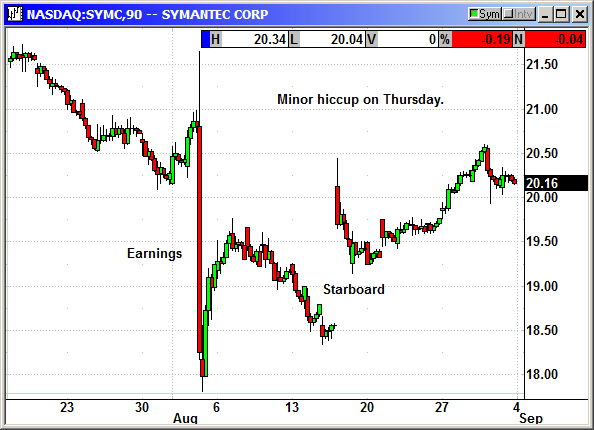 That post earnings rally peaked back on August 20th and shares have been trading sideways as they consolidate. I do not want to buy a 50% gainer until it shows us it is going higher. 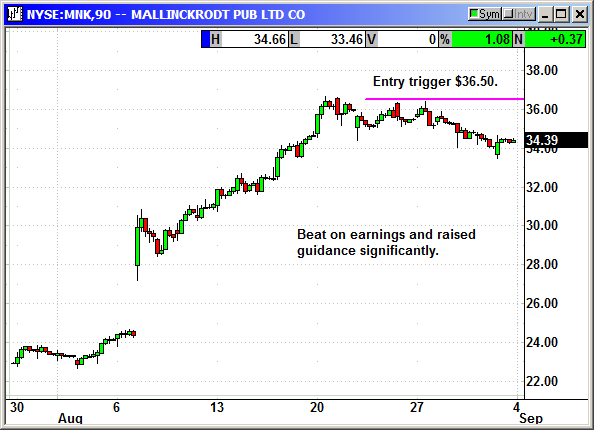 I am going to recommend a $36.50 entry point on a rebound from the current $34.45 close. That puts us just about the perfect spot for a $40 call. We have to buy January because there are no November or December options. Buy Jan $40 call, currently $2.75, initial stop loss $33.50. No specific news. Shares are still moving slowly higher. No specific news. Shares have flat lined after the earnings spike. I am recommending we close the position. No specific news in three weeks. Shares recovered all of their post earnings loss to close at a new high. No specific news. 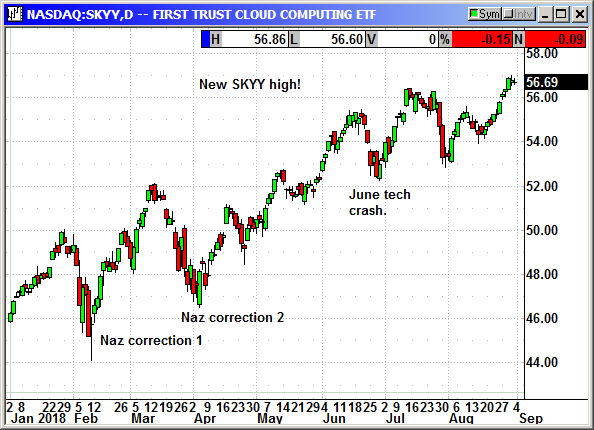 The positive market has lifted SKYY to a new high. No specific news. 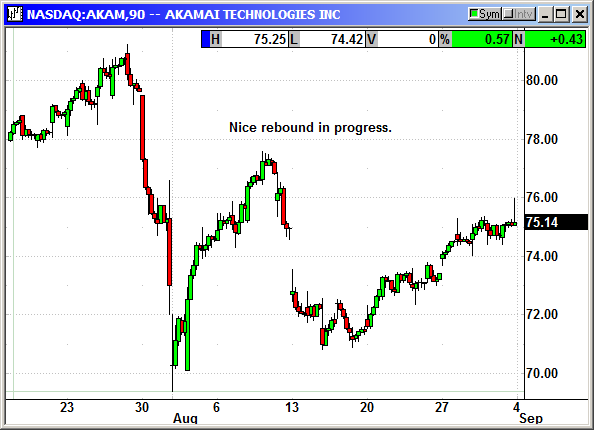 Shares were moving up briskly until Thursday when there was a minor retracement. The VIX/VXX has been reluctant to decline as we enter September, a month known for volatility. Buckle your seatbelt, we do not know what this September will bring.